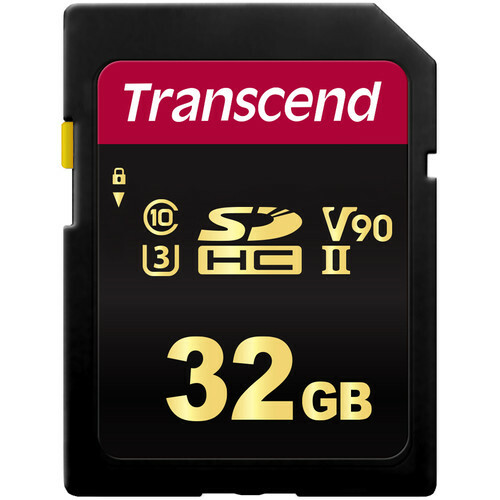 Designed for use in devices that support the UHS-II bus, such as advanced camcorders, DSLR cameras, and more, the 32GB 700S UHS-II SDHC Memory Card from Transcend can capture 4K, 3D, and Full HD video, plus raw and JPEG still images and photo bursts. It has a capacity of 32GB and features a speed class rating of V90, which guarantees minimum write speeds of 90 MB/s. Read speeds are supported up to 285 MB/s and write speeds max out at 180 MB/s. A built-in write-protect switch helps to safeguard against the accidental erasure of card data. UHS-II media achieves its speed through an extra row of pins and while this card has been designed for cameras that are UHS-II / V90 compatible, it may be used in devices that do not support UHS-II / V90. However, bear in mind that this card will then default to your device's speed class and bus rating, such as UHS-II and V60, which support minimum write speeds of 60 MB/s, UHS-II and V30, which support minimum write speeds of 30 MB/s, or UHS-I and U3, which also supports minimum write speeds of 30 MB/s. If your device does not support U3, this card is compatible with the U1 and Class 10 standards, each of which guarantees minimum write speeds of 10 MB/s. As with most Transcend cards, this memory card is shockproof, X-ray proof, and waterproof, while also being able to withstand static, plus temperatures from -13 to 185°F, allowing you to take this card with you into extreme environments. Should the card's data become compromised, you also benefit from Transcend's free RecoveRx software for to help recover deleted content, including photos, documents, music, and videos. Transcend's 700S memory cards are manufactured with MLC NAND flash memory, making them durable and reliable. 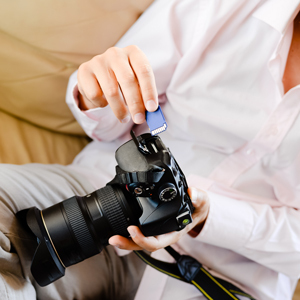 The cards are made for use with advanced camcorders and DSLR cameras, offering professional photographers and videographers fast transfer rates for post-production and high-quality video recording without dropping frames. Transcend's 700S memory cards meet both the UHS-II Speed Class 3 (U3) and the UHS Video Speed Class 90 (V90) standards for 4K Ultra HD video recordings, with read and write speeds of up to 285 MB/s and 180 MB/s, respectively. With a storage capacity of up to 32GB, Transcend's 700S memory cards allow for thousands of photos and hours of Full HD videos to be recorded, meaning you can stay focused on capturing fantastic moments without worrying about running out of storage. To deliver improved performance and stability, Transcend's SD memory cards are tested to withstand extreme conditions. Meets JIS IPX7 standards that can withstand immersion in 3.3' of water for up to 30 minutes. Can operate in extreme temperatures ranging from -13 to 185°F. Meets EMC IEC61000-4-2 standards and withstand static electricity. Meet the ISO7816-1 standard to resist airport X-rays. Provides resistance against shock, vibrations, bending, and twisting. Transcend offers RecoveRx software, a free data recovery utility that allows you to search within a storage device for traces of erased files, including digital photos, documents, music, and videos.